A young John the Apostle leaves his home to follow Jesus in this debut biblical novel. 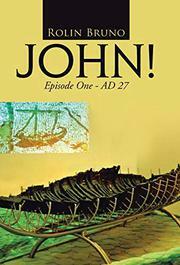 In Bruno’s tale, John, teenage son of Zebedee, has almost wrecked his father’s fishing boat in a foolhardy night voyage with his friends Andrew and Philip. He travels with Andrew from Galilee to Jerusalem to offer doves as a sacrifice for having offended his family. They meet a very young (and fictional) Hezekiah, who helps sell Andrew’s donkey, then tells them of a new prophet who is preaching and baptizing at the Jordan River. Andrew and John travel with friend Nathanael (of Cana) to hear this prophet and are baptized by John the Baptist, who gives John a commentary scroll on Isaiah to study. After encountering new devotees and assisting with the baptisms, John meets Jesus. Seeing his healing powers, John agrees to serve as his lowest servant, to the consternation of the teen’s socially conscious mother. But the position affords John a day-to-day working relationship with the teacher, and Jesus promises him the scroll of Joshua to study. Bruno separates his chapters with exact dates and times (“Thursday 6 March AD 27, 8:00 AM”), meant only to be illustrative. He also gives greater voices to women—Jesus’ mother, Mary, and Concordia, Simon Peter’s wife—than they have in Scripture. Endnotes illuminate prophesies and historical details. The author deftly exposes the bureaucratic, face-saving hypocrisy of Herod, the temple priests, and the Pharisees and Sadducees, which gives proper context for Jesus speaking to the Samaritan woman and his expulsion of the moneychangers. Other scenes, such as Jesus’ baptism and John the Baptist’s arrest, are not dramatized, and the wedding in Cana water-into-wine miracle is anticlimactic. With so many characters, the dialogue seems disembodied at times. And a map with dates would have enhanced Bruno’s timeline. Still, this clever and ambitious reboot of the Gospels succeeds in humanizing these historical figures, and the author’s skillful use of modern slang flows naturally. While sometimes offering a confusing tangle of voices that lack individual features, this tale delivers a fresh and well-researched fictionalization of the assembling of the Apostles from John’s point of view.